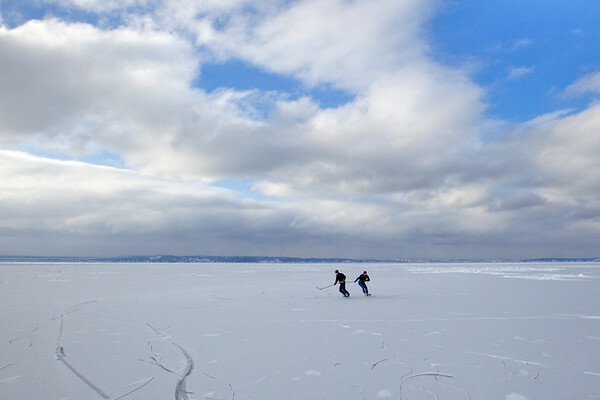 "I can't wait for warm, but for now, this takes it, said Hayden Popp, right, 17, of Elk Rapids while ice skating with his twin brother Max Popp on a frozen portion of East Grand Traverse Bay near Bunker Hill Road in Acme Township on Friday afternoon. The two said they have skated on four or five different area lakes with friends this winter, going wherever there was enough ice and the least amount of snow to shovel off. "Sitting in class today was difficult after yesterday," Max Popp said of their Thursday skate on the bay. "I just wanted to get back out here,"